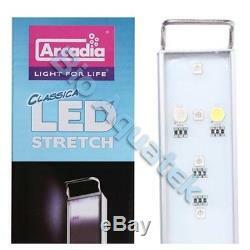 Arcadia Classica Stretch Aquarium LED. Extendable LED for Freshwater Aquariums. Where innovation is concerned, The Arcadia Classica Stretch LED Lamp is number one on the market. Its functional design allows it to extend making it the most flexible light on the market. It will suit most aquariums and comes in a range of sizes. It uses highly efficient LED lights to illuminate your tank while using low amounts of energy but still emitting a bright intense light that will illuminate your aquarium and really accentuate the bright colours in your tank. LEDS tend to burn with high luminosity and last much longer than their T5 & T8 counterparts. The slim line unit is light and versatile and are IP67 rated and therefore fully waterproof. It also comes equipped with a dual switch controller (with a 1.8m length cable) enabling you to move between daytime and night time modes along with optional mounting clips for additional security when fitting the unit to your aquarium. The Arcadia Classica Stretch Freshwater LED light also emit a spectrum of waves that are optimum for plant growth and health and the composition and distribution of light cause a natural rippling effect in your tank. Various lengths ranging from 180mm 1200mm. Light unit waterproof to IP67. All models are 40mm wide x 14mm high. The Freshwater unit utilises a mix of 1.5W at 10,000K, 8,000K, RGB and 0.24W RGB LEDs. Orders placed before 2pm are processed for dispatch on the same day if in stock (you will be notified of stock shortages). For orders placed after 2pm goods will be dispatched the next day. Orders placed on a Friday will be dispatched the following Monday. We are unable to offer our next day courier service at the prices shown for the postcodes / areas below, if you are located in any of the following postcodes / areas we will endeavour to send your parcel(s) with our economy courier service at no extra cost, if this is not possible we will be in touch with the surcharge required. Zone C - AB 31 to AB 38, AB 40 to AB 56, IV 1 to 28, IV 30 to 32, IV 36 & 40, IV 52 to 54, IV63, KW 1 to 14, PA 21 to PA 38, PH 4 to PH 41, PH 49, PH 50. Zone D - HS, IV 41 to 49, IV 51, 55 & 56. KA 27 & 28, KW 15 to17. PA 20, PA 41 to 49, PA 60 to 78, PH 42 to 44. Zone E - Republic of Ireland. Faulty or damaged items need to be reported to us within 14 days of sent date otherwise we cannot resolve any problems. All P&P costs are non-refundable. Bio Aquatek's aim is to provide high quality goods at affordable prices. We strive to bring new and innovative products to the marketplace, including our own brand name products that have been selected or designed by ourselves, to provide the aquatic hobby with the standards expected by dedicated fish keepers. Located in Stoke-on-Trent, we are ideally positioned to distribute goods across the UK, with a fast and efficient service. Please feel free to get in touch for any queries you may have. Bio Aquatek Ltd, Unit 10 Dewsbury Road, Fenton, Stoke on Trent, ST4 2TE. Sign up to our newsletter to be informed of our special offers and new items. The item "Arcadia LED Stretch Aquarium Fish Tank Light Freshwater CS30F 11w 30cm 45cm" is in sale since Thursday, September 3, 2015. This item is in the category "Pet Supplies\Fish & Aquarium\Lighting & Hoods". The seller is "bioaquatek" and is located in Stoke-on-Trent. This item can be shipped to United Kingdom, Austria, Belgium, Bulgaria, Croatia, Cyprus, Czech republic, Denmark, Estonia, Finland, France, Germany, Greece, Hungary, Ireland, Italy, Latvia, Lithuania, Luxembourg, Malta, Netherlands, Poland, Portugal, Romania, Slovakia, Slovenia, Spain, Sweden, Canada, Brazil, Japan, New Zealand, China, Israel, Hong Kong, Norway, Indonesia, Malaysia, Mexico, Singapore, South Korea, Switzerland, Taiwan, Thailand, Australia, United States.